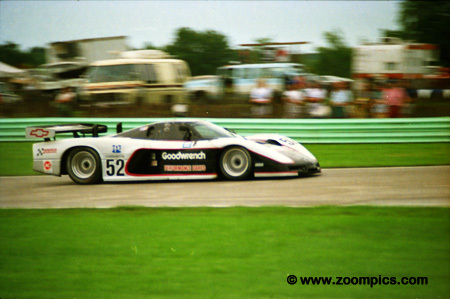 Round thirteen of the 1987 IMSA Camel GT series took place at Wisconsin’s Road America. The event boasted a strong field of fifty-three starters. But the race had more than its fair share of attrition much of which could be attributed to the wet conditions. The wet and unpredictable weather that impacted the race started with the first practice session of the event. Friday's practice was delayed by 30-minutes due to fog. There was rain during the second practice and qualifying for the front row took place in drying conditions. On race day, rain caused the start to be delayed and another deluge during the race resulted in a red flag. Due to these conditions IMSA officials changed the race to a timed event – teams were informed that the checkered flag would appear at 6:00 p.m. The field exits the final turn and heads towards the Starter for the green flag. 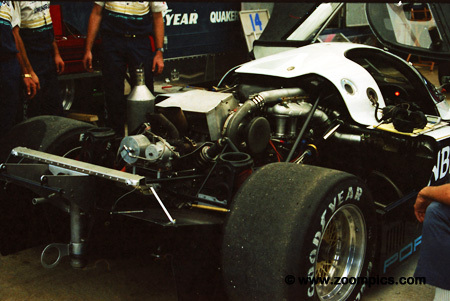 On the pole was the Electramotive Nissan GTP ZX-T driven by Elliot Forbes-Robinson and John Morton. Starting beside them was the Chevrolet Corvette of Sarel van der Merwe and Doc Bundy. Dyson Racing's primary driver, Price Cobb, was joined by Johnny Dumfries for the Road America event. In 1986, Dumfries drove for the Lotus F1 team. The pair started ninth and navigated the changing weather conditions better than the competition to capture the win. It is interesting to note that Dumfries was born into one of Scotland's oldest aristocratic families and is the descendant of a British Prime Minister. 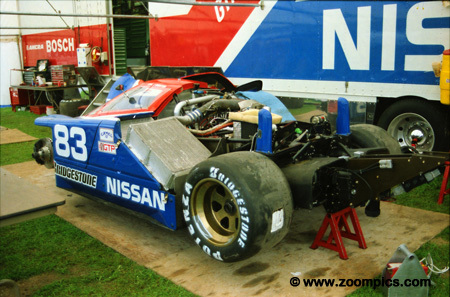 Starting on the pole was Elliot Forbes-Robinson in the Nissan GTP ZX-Turbo. Qualifying began in the damp and the track dried over the course of the session. EFR made the right choice of tires and earned Nissan's fourth pole of the season. Forbes-Robinson and Morton ran comfortably up front until they fell victim to a faulty coil which left Morton stranded on the course. The duo would finish seventh in GTP. 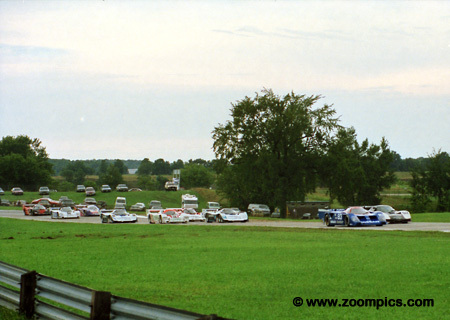 Al Holbert entered two Lowenbrau Porsches at Road America. The driver line-up consisted of himself, Chip Robinson and Derek Bell. The intention was to race only one car but to protect Robinson's points lead both cars started the race. The team finished second and third with Robinson and Holbert in the runner-up position to the Dyson Porsche. Gregg Pickett and Tommy Riggins qualified and finished second in the Protofab Chevrolet Corvette. Initially they were classified third but a scoring error was corrected by IMSA. In the rain, their teammates Chris Kneifel and Paul Dallenbach proved to be the class of the field - scoring the GTO win from the twenty-second starting position. 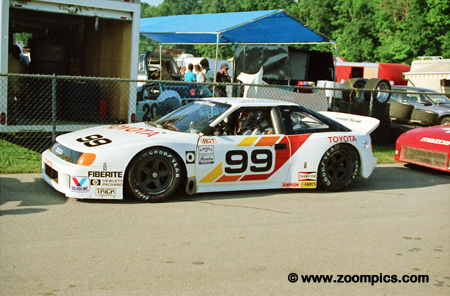 The All American Toyota Celica Turbo was shared by Rocky Moran and Wally Dallenbach Jr. This paired qualified fifth in GTO behind their teammates Juan Manuel Fangio and Chris Cord. During the race Cord suffered a nasty crash but Moran and Dallenbach finished third in class. The No. 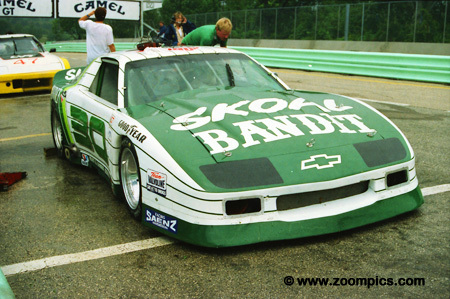 30 Skoal Bandit Chevrolet Camaro was driven by team owner Buzz McCall and Walt Bohren. The pair started eleventh and finished fifth in GTO. 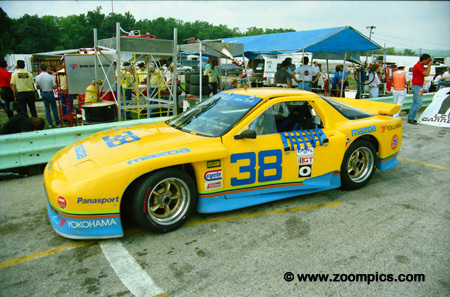 Bohren had most of his success racing Mazdas winning the 1980 GTU title in an RX-7. 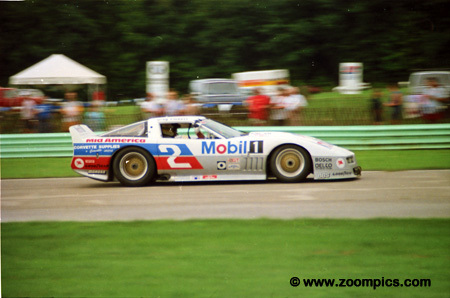 The long straights of Road America favoured the 3.0 –litre V6 turbocharged engine in the Rick Hendrick Chevrolet Corvette GTP. Sarel van der Merwe and Doc Bundy started second. The team was in contention until the heavy rains came on lap-39. These conditions led to the retirement of the car. At this point in the season, Tom Gloy was second in the GTO driver standings. 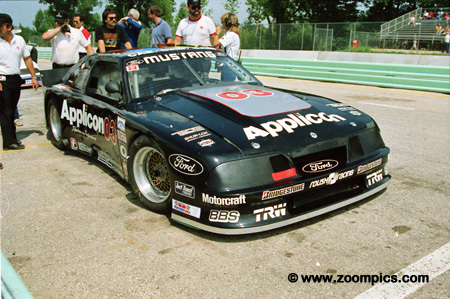 To support him - Jack Roush’s strategy was to put Gloy in the best placed Mustang at the half-way point of the race. This decision was made easier when Pruett jumped to an early lead. However, Pruett crashed and although the car was able to continue Mustang retired with Gloy at the wheel. Roger Mandeville’s efforts in GTO were not as successful as the Mazda RX-7s competing in the GTU class. The three-rotor version of Mazda’s rotary engine produced approximately 450-horsepower. But this was no match for the V6, V8 and turbocharged engines used by the competition. 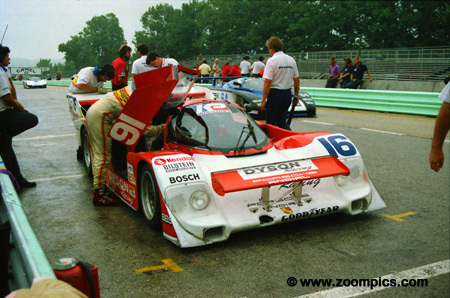 At Road America he shared the car with Kelly Marsh and finished tenth in class. In 1987, the Spice chassis took class victories at the 24-Hours of Daytona and Le Mans and captured the World Sportscar Championship. Spice Engineering was founded in the early '80s by brothers Gord and Derek Spice but folded in the mid-90s after ambitious plans to construct a Formula 1 car failed. The No. 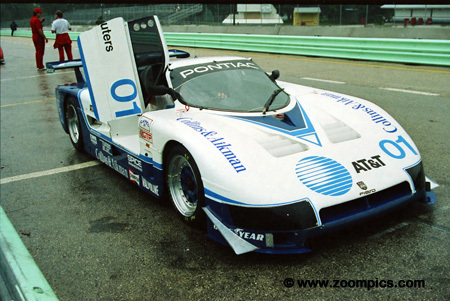 01 driven by Kline and Bell finished second in GTP Lights. Former Olympic Gold medal winner, Bruce Jenner, shared the No. 33 Roush Ford Mustang with Bobby Akin – son of IMSA regular Bob Akin. The pair managed a sixth place qualifying spot in the GTO class but retired after 50-laps with an engine problem.